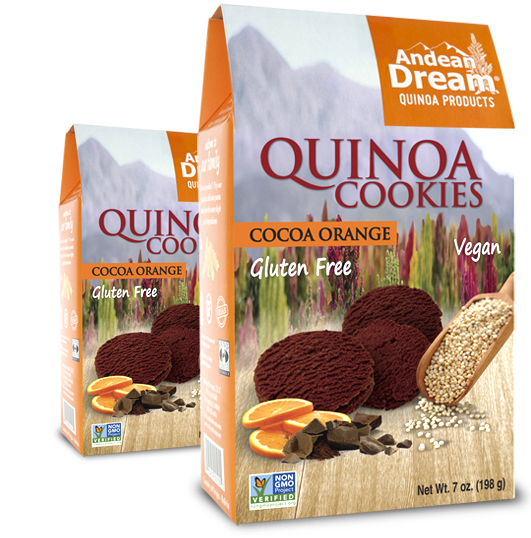 Andean Dream Quinoa Cookies are made with organic Royal Quinoa, the finest quality in the world, found only in the Bolivian Andes. 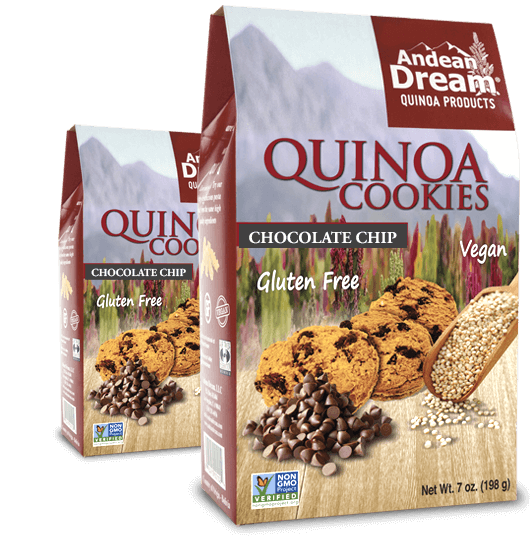 As a member of the Fair Trade Federation, we source our quinoa from indigenous farming families, and then send it directly to our dedicated manufacturing facility, free from gluten, dairy, eggs, soy and corn. 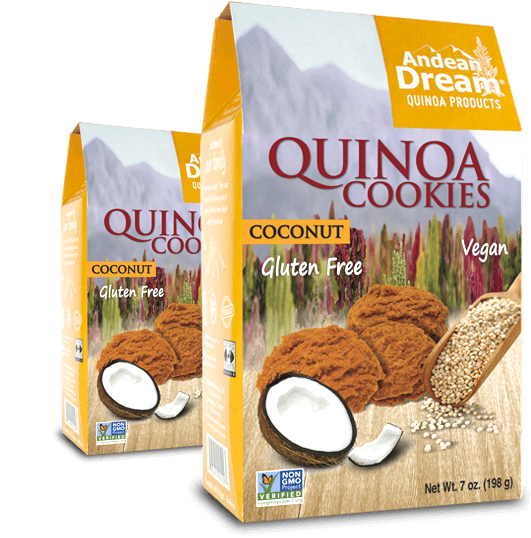 Enjoy Andean Dream Quinoa Cookies for their delicious flavor, high nutritional content, and our commitment to bettering the lives of others, one cookie at a time. 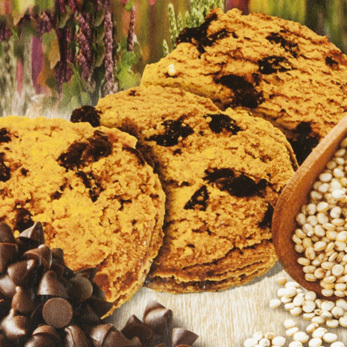 Our cookie wrappers are made from 100% recyclable food-grade mylar. You may think "why use wrappers at all?" It's so you don't have to use non-biodegradable snack bags or potentially harmful plastic storage containers. All of our other packaging is also completely recyclable, as well. So please don't throw away the cookie wrappers or any of our packaging; instead, kindly recycle. 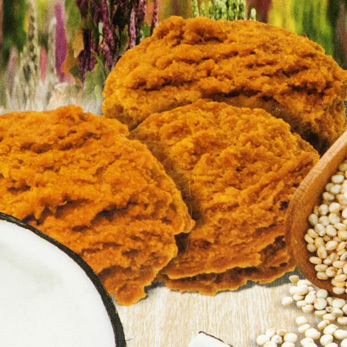 Organic Royal Quinoa flour, tapioca flour, non-hydrogenated palm fruit oil, organic raw sugar, toasted grated coconut, organic sugar cane syrup, organic white rice flour, sodium bicarbonate (baking soda), natural coconut and vanilla extracts (corn free). All ingredients are GMO free. 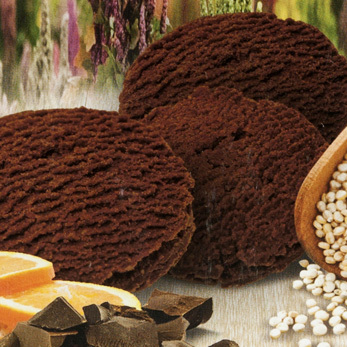 Organic Royal Quinoa flour, non-hydrogenated palm fruit oil, tapioca flour, chocolate syrup (soy free), organic raw sugar, organic white rice flour, organic sugar cane syrup, sodium bicarbonate (baking soda), natural orange, vanilla and chocolate extracts (soy & corn free). All ingredients are GMO free. Organic Royal Quinoa flour, tapioca flour, non-hydrogenated palm fruit oil, organic raw sugar, dark chocolate chips (dairy and soy free), organic sugar cane syrup, organic white rice flour, organic quinoa pop grains, sodium bicarbonate (baking soda) and natural vanilla and chocolate extract (soy and corn free). All ingredients are GMO free.